I try to read a short story, or part of a long short story, every single night. A good habit I started years ago. In the past couple months I picked three books with the word Dark in the titles: Haunted: Dark Delicacies III, Dark Masques, and its companion, Darker Masques, off my shelf I store books I bought with the future promise to read as soon as I get home from the bookstore! Completing this maze took Kim (an adventurous friend) and I quite some time! But at least we escaped before they let the monsters loose. 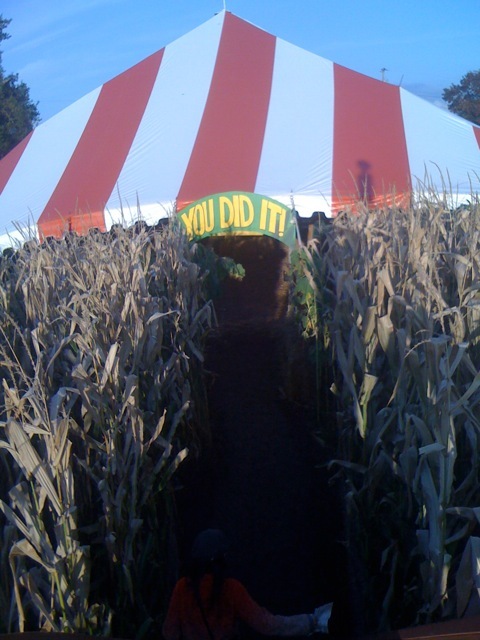 Visit this famous maze and Halloween Orchard South of Portland, Oregon. Del Howison is the founder of the world’s most famous horror emporium and bookstore, Dark Delicacies, in Burbank, CA. He uses his friendships in the horror field to compile these anthologies with editor Jeff Gelb, who is the leading anthologist in contemporary horror. Find all three of their collections. There are 21 tales in Haunted: Dark Delicacies III by a diverse group — Simon Clark, whose Children of the Vortex brought shivers, Richard Christian Matheson, John Connolly, Ardath Mayhar, Clive Barker, Chuck Palahniuk, David Morrell, Mick Garris and many others — and the best of these tales stand out and linger long afterwards, haunting dreams and some waking moments when shadows shift in the dark corners of the house. Beware! This book is available in paperback and eBook. 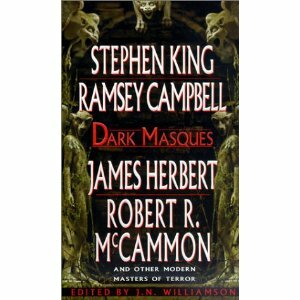 Each Dark Masque title combines two short story collections, and dozens and dozens of stories, most in the suspense/horror genre. I find myself willing to go to scary places before bedtime. Maybe to jumpstart fantastic dreams. 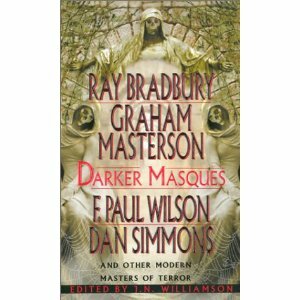 Dark Masques and Darker Masques feature brilliant stories by masters of the genre, including: Stephen King, Ramsey Campbell, James Herbert, Robert R. McCammon, Ray Bradbury, Graham Masterson, F. Paul Wilson, and Dan Simmons. One story that lingers is Sea Gulls by Gahan Wilson, a fantastic story about a man who becomes increasingly annoyed by his mate. The best of them stuck in my head and colored my dreams after sleep took me, and I loved to travel to their macabre worlds. Some would say wishing for nightmares is a bit silly, or even more than odd, worse than just silly, but in dreamland I like to believe I can figure a way out of dire situations. Growing up a child of the seventies, where the horror films and books of the day became brilliant mirrors to real life struggles, I wouldn’t have it any other way. These collections are available in mass market. After I put the Masques away I started ten days of tales by current masters of the genre. Aberrations is a new eBook anthology of ten tales by Bram Stoker Nominee and Editor/Writer Jeremy C. Shipp. These tales of monsters, the subject that linked the stories with an atmosphere of dread and filled with dreadful things, are perfect Halloween bedtime reading. Each writer has a singular voice, and the stories that stayed in my head, thinking of the creative drive and lyrical writing, are Bug House by Lisa Tuttle, Survivors by Joe McKinney, The Hounds of Love by Scott Nicholson, Goat Boy by Jeremy C. Shipp, and the weary voice of a Piper in hiding in Patrick Burke’s From Hamlin to Harperville. Download this eBook collection and check out the authors and their other books too. The two collections of stories I’ve been savoring this month are by two extraordinary writers. 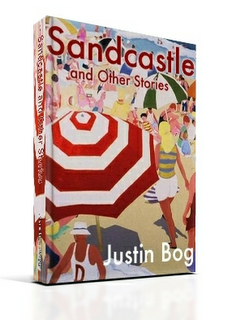 To buy or download a free sample of Sandcastle and Other Stories for kindle readers or for iPad, PC, Mac, or iPhone with the kindle app, click HERE. While at Amazon, please hit the Like button. It’s a great way to show support for your favorite authors and their books. And please leave a review if the book hits you well. I’m weird, I keep looking at the cover for “Aberrations” and thinking how awkward that had to be to shoot LOL! There are several here that I think will go on my “TBR” list. I know, Dee. Some of those tales were shivery, as cool and unique as the cover. The pied piper tale was really great. You would love Laird Barron’s work. He’s a new master of horror and his writing elevates the genre into literary. I haven’t loved a horror writer’s short fiction as much since Clive Barker’s Books of Blood way back in the 80s. Lovely post, Justin, and some very interesting anthologies to check out – thank you. The maze is awesome. I would love to navigate that! I want to read Washington Irving’s headless horseman tale again to wash Tim Burton’s Sleepy Hollow out of my attached head. The maze took so long to find the end; who knew mazes could be so clever in design. 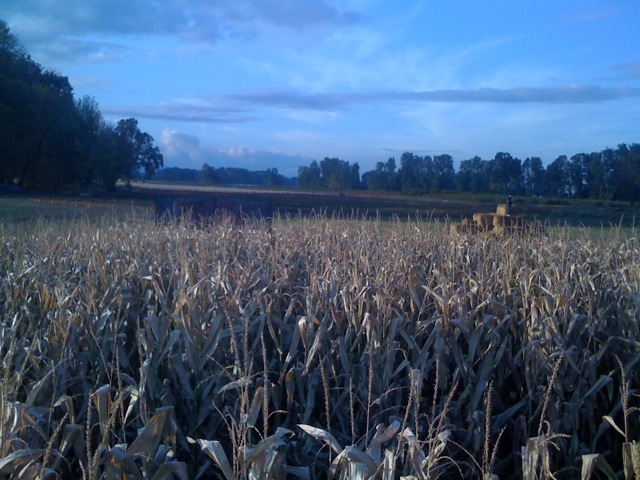 This one had chicken wire woven through the corn walls so no one could just jump through rows in frustration. 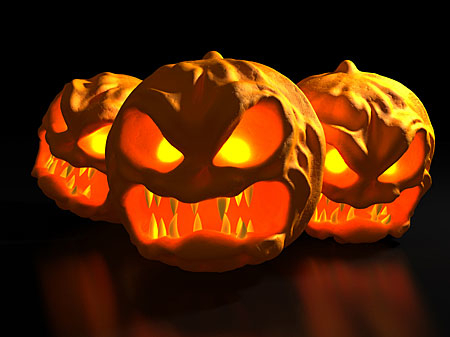 And there was a completely different night time maze of “screams” that added monsters lurking about. All for fun. That would be perfect, T . . . I’d love to read something really scary right now. Please do. I am working on a few tales myself, but the main one is of the Christmas variety . . . just got a first draft down and it’s far from ready.